After the alterations, the vessel is expected to resume its journey in sea and marine life research until 2030. Before the vessel can set sail again, the people working in the shipyard still need to push through the final showdown. To describe the process in more familiar terms, cutting and extending a ship could be compared to a difficult surgical operation where cut tendons or veins need to be carefully reconnected to help the patient resume normal life. Similarly, all the cables for power, manoeuvring, monitoring, and data communications in the vessel's cutting point must be connected in such a way that after installing the extension piece the vessel's cables are fully functional and the vessel is ready and fit to sail the seas. Caverion technicians dismantled all the systems in the cutting point and marked the cable ends. This created a cluster of four hundred cable ends where each end is marked with a running number. With surgeon-like precision and electrician's expertise, the cables were extended to match the vessel's new future length. “All systems that were located in the vessel's cutting point were cut and removed, and all cables were marked to be able to extend and reconnect them. It was a project of about four hundred cable ends,” says electrician Mikko Lehtonen. In a 30-year-old vessel, even an experienced technician's professional skills are put to the test because building something new in the midst of the old is always a challenge. The lack of images and diagrams, incomplete plans, and unexpected obstacles demand creativity and patience. A busy schedule and professionals from different fields working simultaneously on the same system requires game sense and constant dialogue. “Despite of tight schedule, rush, many teams in the same installation site, and many risks of hazard, the whole crew is still very well on top of things,” says Max Nylund who is the responsible foreman. 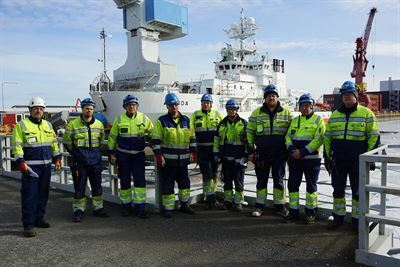 “The job of a foreman is not usually this varied, but this has certainly given an opportunity to do all sorts of things from bow to stern and anchor to mast,” Lehtonen reports. “You can't do wrong when you just don't necessarily have any images for every part of the vessel. Plans and creative solutions, however, are created on the fly,” says Pauli Laaksonen with his thirty-year work experience. The limited workspace is a place where people of different professions and cultural backgrounds encounter one another, occasionally creating a language barrier. But the men from Caverion report that the work has been done with a smile on everyone's face. 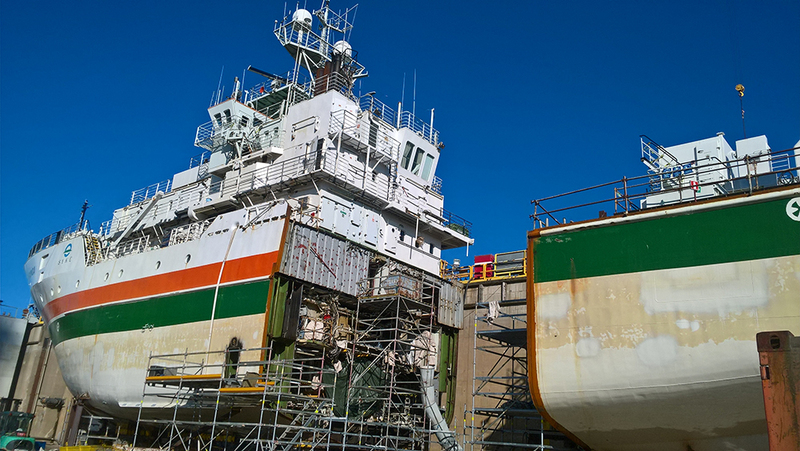 The work is challenging because projects like this do not sail ashore every year, even though a rebuilding and technology modernisation project like this could turn many vessels into good as new and eco-friendly. After the renovation, Aranda can run on biodiesel all year round and make short trips with just battery power. This reduces emissions and the vessel's noise that impacts marine life. Caverion is working as the partner of Telesilta Oy. Telesilta is responsible for the vessel's electricity including procurement. Caverion is responsible for implementing electrical installations, commissioning, and resourcing. 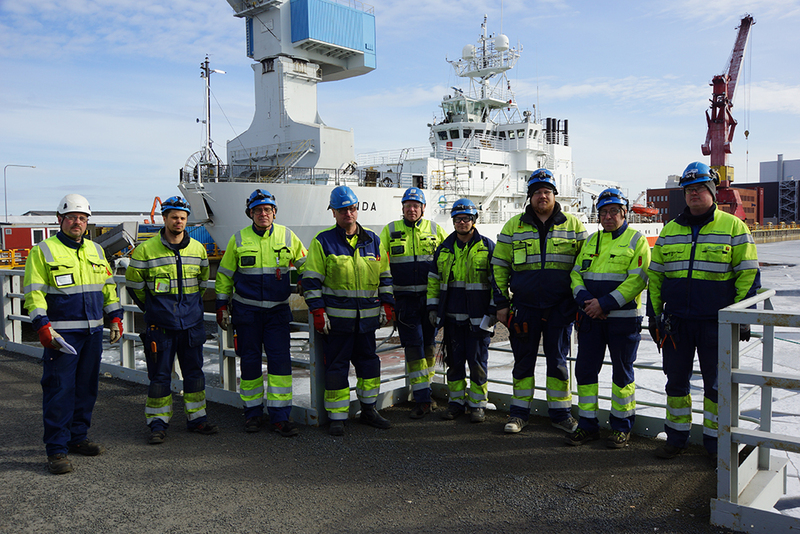 Marine Industry at Caverion and electrical automation in Satakunta are implementing the project in collaboration.